Melvin Newland tells a story about a little boy who had a special, secret place to hide and be all alone. On the back of their property was an old fruit tree. It had lots of leaves, but it had produced no fruit in years. High up in its branches, hidden from view by the leaves, there was a perfect spot for him to pretend being Tarzan of the jungle, or the commander of a space ship, or anyone a little boy could dream about. It was also a place to hide when he felt mistreated or misunderstood. What could the little fella do? Suddenly a wonderful idea came to mind. There were some apple trees in a nearby field. That evening while his parents were busy, he and his best friend got a whole basket full and tied them the stems to almost every limb of the old fruit tree. “That’s amazing,” replied his smiling wife. We chuckle at this story because we understand the principle of sowing and reaping in agriculture. But sometimes we fail to appreciate it’s universal application in life. 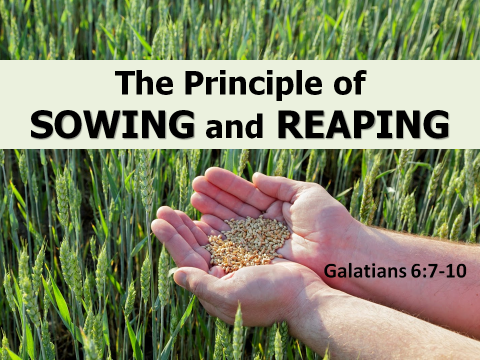 Paul reminds us that the principle of sowing and reaping is true in the spiritual realm as well. “Do not be deceived, God is not mocked; for whatever a man sows, that he will also reap. For he who sows to his flesh will of the flesh reap corruption, but he who sows to the Spirit will of the Spirit reap everlasting life. And let us not grow weary while doing good, for in due season we shall reap if we do not lose heart” (Gal. 6:7-9). Several lessons come to mind. The Bible often warns against the problem of self-deception. Through our pride, self-reliance, or the deceptive devices of the devil, we can be deluded into thinking we can sow one kind of seed, but produce a different fruit. Both the law of nature and the law of God warn us against such a foolish notion. (2) God is not deceived. God is not duped by our attempts to circumvent His laws. He sees. He knows. He understands our motives. And can look into the hidden recesses of our heart. God will not be mocked by our feeble plans to outwit Him. (3) Stay focused on the harvest. When I was a kid growing up in central Indiana, we farmed corn and soybeans. Dad knew how much corn we needed to feed the farm animals. The soybeans were planted to be sold as a cash crop. Our labor was motivated by a purpose. And we understood the process. You sow in the Spring. You reap in the Fall. The harvest doesn’t occur tomorrow. It comes later. Spiritually, it might help us to apply that kind of thinking. To be more heavenly minded. To focus on the future. To recognize the reward that awaits us. To realize when we “sow wild oats” to satisfy the flesh, we’ve lost sight of both God’s principle and promise about of sowing and reaping. If you want corn, plant corn. If you want beans, plant beans. If you want wheat, plant wheat. Farmers understand that. And so does even the casual observer. So, if you want to be loved, sow seeds of love. If you desire to be understood, sow seeds of understanding others. If you seek forgiveness, be willing to forgive. If you expect to be respected, demonstrate respect. That seems so simple. So easily understood. Yet so often overlooked. (5) Your harvest will be greater than what you sow. A single seed of corn can grow a huge stalk with one or two ears of corn. A single ear of field corn can have as many as 700 seeds. So, one seed may reproduce itself 1400 times. The small seeds of kindness, compassion, and friendship that we daily sow may seem small and insignificant. Yet they are filled with the potential for growth and greatness.